In the weeks leading up to December 12th, we will be profiling some of the most fun, creative and sumptuous foodie talents whose wares and goods might just be the most original gifts under the tree. While living in Tokyo, Mantell enountered onigiri (sticky rice balls) for the first time. 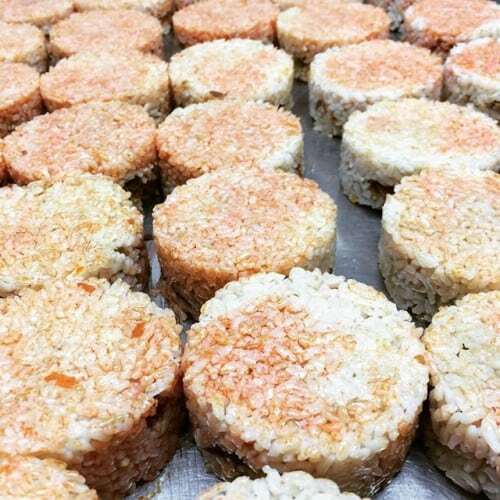 After returning to Canada, she decided to source ingredients for onigiri, offering Canadians a delicious, nutritious and convenient snack or meal. Tell us about your company and your signature product OKAZU. 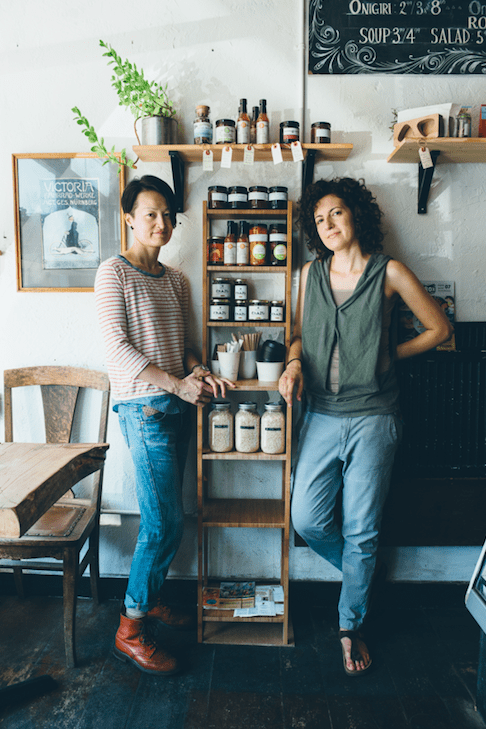 Abokichi is a Japan-inspired casual food company. OKAZU is an all-natural, handcrafted, all-purpose condiment made from organic miso paste, sesame oil, and spices. The inspiration for our original chili flavour comes from the chili oil often served with Chinese dumplings. Our recipe is thicker and less oily with a much milder flavour, making it an interesting alternative to that other all-purpose condiment, ketchup. How do you suggest people use it/eat it? At first, we made OKAZU to eat with plain white rice, as this type of product is commonly eaten in Japan; however, it is also fantastic on potatoes and pasta, or in sandwiches. We don’t remember what life was like eating scrambled eggs without OKAZU, plus we always like to bring a jar or two when going to a summer barbecue. What does Christmas look like in Japan? What traditions are different from Canadian Christmas? Christmas in Japan looks very much like Christmas in Canada; there are Christmas gifts, decorations, and music. Although less than 3% of the population of Japan are Christian, nearly everyone gets into the festive spirit and many western traditions have been reinterpreted and adapted to become uniquely Japanese. One thing that may be surprising is that Christmas in Japan is seen as a romantic time where one should have a date to walk hand-in-hand with while admiring the elaborate Christmas light displays. For families, there is a traditional meal, but turkey and ham aren’t typically on the menu. Preparing for the special get together requires that you call a week in advance to reserve your family pack of Kentucky Fried Chicken. We aren’t sure where this tradition came from, but the Colonel’s resemblance to Santa Claus is very suspicious. OKAZU on potato latkes, and a little time off. We are going to visit Japan and it will be great to spend time with family and friends there, plus visiting hot springs and some of our favourite restaurants, galleries, shops, and neighbourhoods in Tokyo. What was your favourite gift as a child? Do you remember one season more than the others? Jess: I think that the “tradition” of giving a new gift for a each night of Hanukkah is a myth. There was one year, however, I think I was around five years old, when I had a pretty good run of gifts and my collection of My Little Ponies saw a major upgrade. Fumi: When I was twelve years old, I asked Santa Claus for a Gundam Suit (it’s a giant robot that you can climb inside of and control, and it isn’t even a product that you can buy). My parents must have been frustrated with both my ridiculous request and my continued belief in Santa Claus because all I received that year was a box of crayons (not a big fancy box, just like the basic 8-pack). All the energy leading up to Christmas is pretty exciting. Although we dread the coming of winter and the cold and ice, the start of winter and fresh snow is actually a really enjoyable time. We are really looking forward to joining the Foodie Artisan Market and checking out all the other delicious things on offer. Follow Abokichi on Facebook or Twitter. Join us at the Foodie Holiday Market on Saturday, December 12th, 10am-5pm at Artscape Sandbox (301 Adelaide St. W). Exhibitors include Nadege, Emerson Pringle Carpentry, The Rolling Pin Donuts, Provisions Food Company, Burner Hot Sauce, I Love Puffy Love, Roselle Bakery, Lee’s Ghee, Hinkleville, Petits Mots and so many more. FoodiePages is our go-to for finding the most unique foodie gifts by incredible local vendors and chefs. Connect with Canada’s best artisan food and drink makers now.